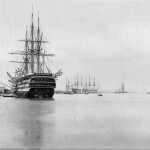 Today in Gosport’s Past:- HMS “St Vincent” (the third Royal Navy ship to carry the name; the first wo being captured Spanish & French vessels, with very short RN careers)) was launched at Devonport on 11 March 1815; she was a 120-gun first rate ship of the line, one of three ‘Nelson’ class ships, and the only one of them to see active service. 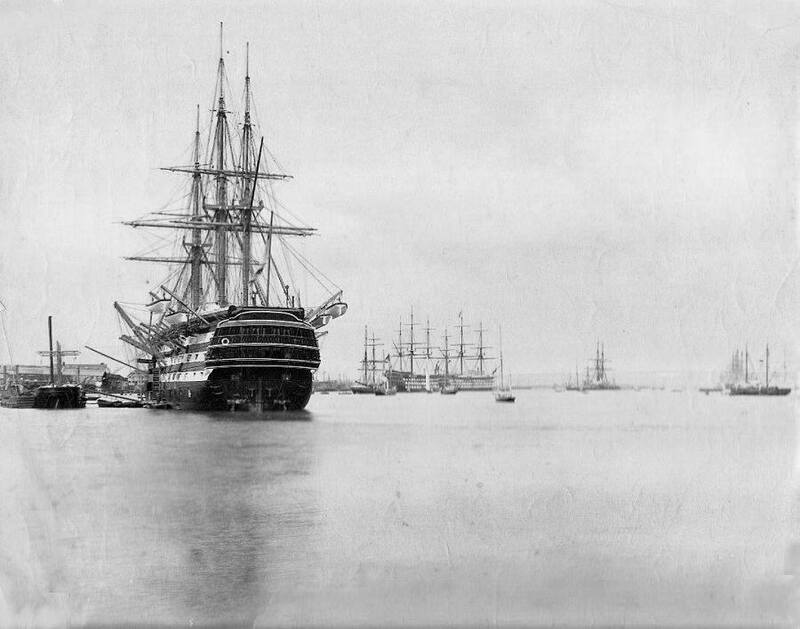 Not commissioned until 1829, a fairly undistinguished career followed, and from October she saw harbour service in Portsmouth as a flagship & depot ship. 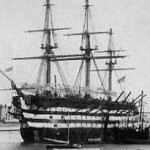 From 1 January 1862 she was used a training ship at Portsmouth, and in 1870 the ship, which had just 26 guns remaining, was moved to Haslar (near where the Gosport Marina lightship ‘Mary Mouse 2’ is now), and used for training boy seamen; the ship, being permanently moored in the same position for some 35 years, featured in a good percentage of photographs of the harbour at the time. 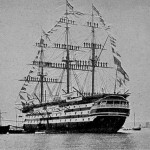 Her training career ended around 1904, and she was sold for scrap in 1906, and broken up in Sheerness. 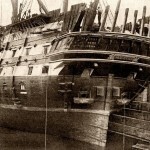 Just for the record, the fourth, and last floating HMS ‘St Vincent’ was built in Portsmouth dockyard, being launched on 10 September 1908, and completed in May 1909. 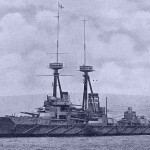 She was a ‘Dreadnought’ type battleship which saw some action in WW1, after which was used as a gunnery training ship at Portsmouth from March 1919 until June 1919, then sent to Rosyth, remaining there until sold for scrap on 1 December 1921, and scrapped at Dover in March 1922. 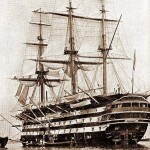 At this point I should mention HMS ‘St Vincent’ the shore establishment. 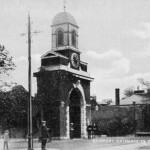 In 1807, Forton barracks was built, being used by a series of various servicemen having business in Gosport, but was handed over to the Portsmouth division of the Royal Marines Light Infantry in 1848, an arrangement which lasted until 1923, when an amalgamation with the Royal Marine Artillery occurred. In 1893 a 400-seater theatre was added within the barracks. By 1923, the barracks needed a lot of repair work doing, estimated cost £60,000, so the Marines moved to Eastney barracks on 1 August 1923. 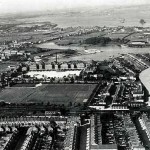 Following the essential repairs, Forton barracks reopened in 1927 as a training school for boy seamen, and named HMS St Vincent, being commissioned on 1 June 1927. At some stage, a swimming pool was built for the barracks to the north, adjacent to Forton Lake, partially built on a graveyard; the swimming pool was demolished sometime in the 1970s, I think. 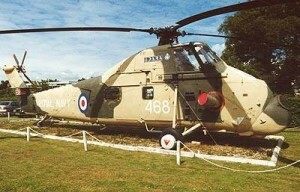 At the beginning of WW2, the barracks became a training centre for officers of the Fleet Air Arm (the boys having been evacuated to HMS ‘George’, on the Isle of Man, in 1939), and a torpedo training section was opened on 22 July 1940. 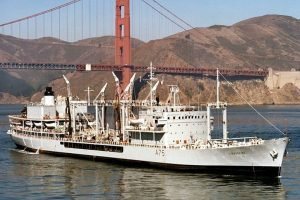 On 1 December 1945, it reverted to training boy seamen, remaining as such until the establishment was officially closed on 8 December 1968, although the white ensign wasn’t lowered for the last time until 2nd April 1969, and sold to developers the following day. 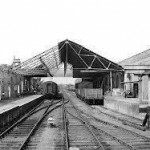 ALSO Today in Gosport’s Past:-exactly 75 years ago today, on the night of 11 March 1941, Gosport station lost its roof after incendiary bombs hit the station during a German air-raid. 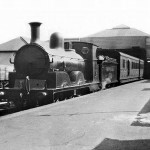 The overall station roof was (possibly) just short of its 100th birthday, certainly having been completed before the first train reached Gosport on 24 November 1841. The roof had certain characteristics; the station had been allowed (by the Military) to be built fairly close to the town’s ramparts, within the 200-yard exclusion zone vital to such fortifications. 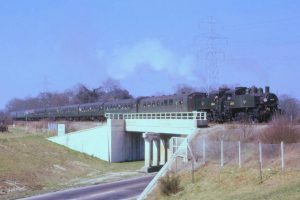 Stipulations included a height restriction on any buildings erected within ‘the killing zone’, and the one particular to the station was that the overall roof had to be built with an all-round parapet which could be used as firing positions by troops in the event of attack. 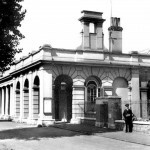 After the air-raid, the parapets at the east & west ends of the station had been destroyed, and although HALF a roof was later constructed, only the goods platform was covered, as the structure was never completed, leaving the passenger (south) side of the station open to the elements. 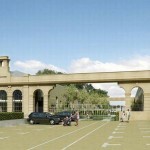 One of the iron upright stanchions holding up the replacement roof has been saved (after a fashion), and can be seen layed down on the south side of the current car park fence opposite the collonades. 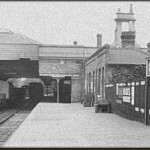 Since being rebuilt a few years ago, the original parapets have been restored and extended across both ends of the station, unlike the old wooden boarded parts over the tracks, albeit without the actual roof being replaced. 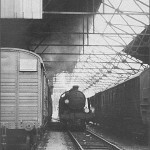 The bombing of the station roof followed the destruction of the nearby engine shed on 6 December 1940 by enemy action.